As most people who follow my social media accounts know I took up running four or five months ago. One of the main things that keeps me running four or five months later is my phone and it's ability to both track my runs and keep me somewhat entertained/focused while running. So I thought I'd start off 2015 with an update to my running gear a set of Bluetooth stereo earphones. Problem is I'm just not sure if they (stereo Bluetooth earphones) are any good, and I wasn't about to buy a $100+ set only to find out I didn't like them. So I went eBay shopping. I don't normally highlight a mobile photo here on my blog. I tend to use my VSCO Grid to show them. The reasons aren't necessarily because they aren't as good of photos taken with my dedicated camera, but because usually there's just less that can be done. Or more accurately, if using RAW photos allows me to push processing to 11, using JPEGs are more like a 5. And that's starting off with a clean photo to begin with. This photo wasn't clean, was shot through a dirty window at Denver International, and was noisy all over. The X, to it's credit, did automatically select to use it's version of HDR processing, which at least gave me something to work with. Day 3 of the nature photography challenge. I know I've shown this before on the site, but it's one of my favorite shots of this year. Day 2. 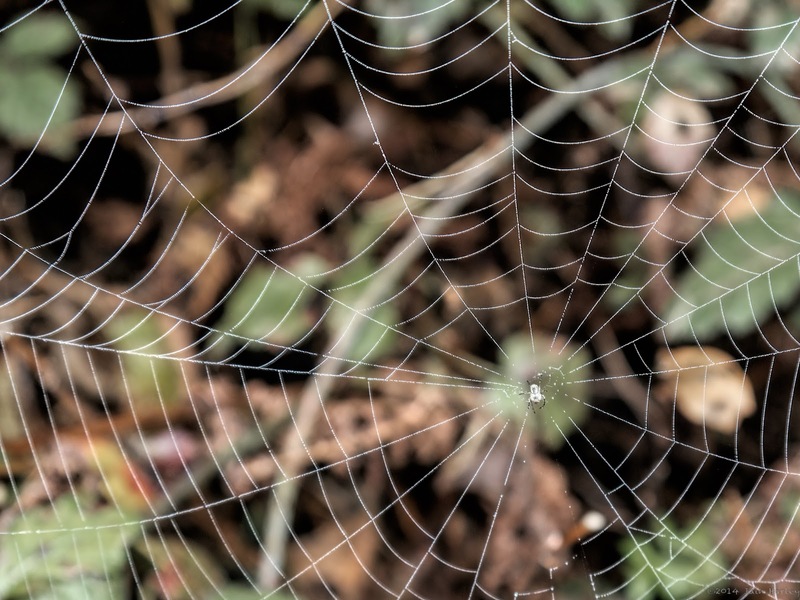 Again from the archives, and admittedly not one of the better spider/spider web shots you'll see. I think part of the problem with this shot is the spider is too small, it's really not as out of focus as it looks when you zoom in on it, but the web was the focus of this shot for me. If you're a photographer chances are you've seen the various 5 day challenges going around the various social media sites. Last year I took part in a number of different short challenges, in between my year long photo project and my own personal photography. They're fun and usually a nice break from the other projects I have going on. This year I've not had much of a desire to take part in even the short five day challenges. Also, thankfully, I've not been called out by many to take part in a challenge. But when +Chuq Von Rospach of http://www.chuqui.com/, a photographer I admire, and a good all around guy, I felt I should take part. Now there doesn't seem to be any rule stating that photos need to be taken during the 5 day series so since I've been going through my archives I'm going to post never before seen photos, starting with this one. A redwood grove in black and white. The theme over at +The Patch - PhotogrAphy Themed CHallenge was Urban Landscape. I didn't have a chance to shoot for that week, but since I was going through my archives and cleaning them out I ran across some San Francisco shots that I felt would work. For choices I wanted to choose a photo I hadn't used before and hadn't processed before. 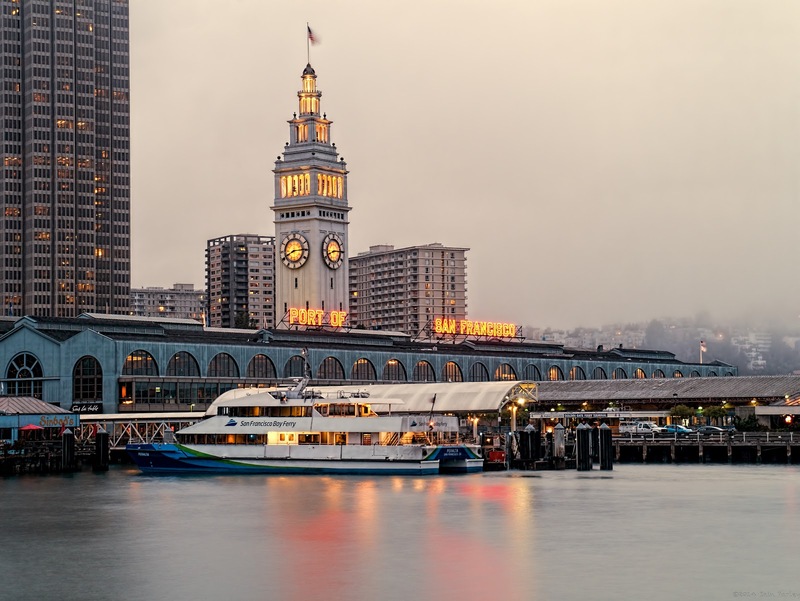 This is obviously the Port of San Francisco with a ferry coming in taken from pier 14. Digital cameras are great. You can shoot and shoot and shoot and shoot and not worry about wasting shots. Storage cards are cheap and plentiful, and the hard drives/SSDs/cloud backup these photos get stored on are also cheap. So why not shoot everything AND keep everything? Because looking through a project where you shot 47 pairs of an arch looking for the right shutter speed and timing of the water is annoying a year later. Because looking through a bunch of crap shots that you kept because maybe you can save one of those 47 pairs in post processing is a lie. 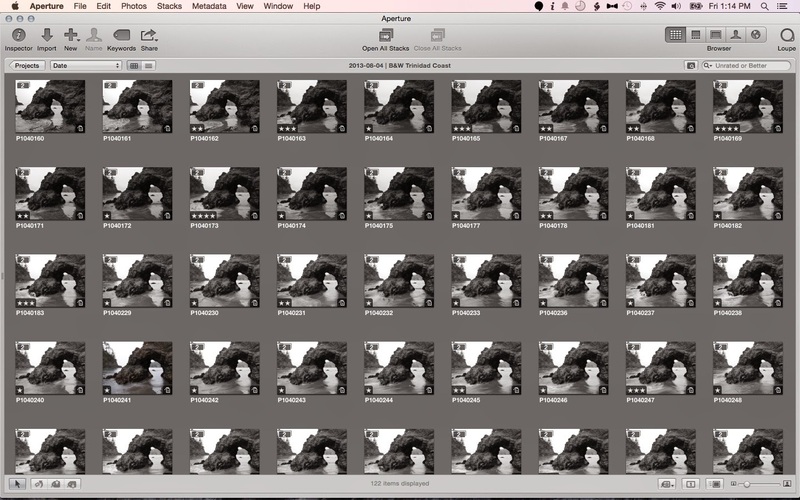 There's no way I was going to process all 47 pairs (they're pairs because my camera was set to shoot B&W JPEGs and color RAWs) in search of the best final shot. Now thankfully at some point shortly after import I rated these shots. Basically I only ended up keeping the couple 4 star shots and deleted the rest. Odds are I won't miss those other 45 pairs. Like most photographers I shoot with two cameras; my dedicated camera and my phone. I like the flexibility because the phone let's me shoot and share right away, and I get to grab those shot's GPS coordinates and import them to my non GPS'd shots once I get into Aperture. The other nice thing with using Google's photo backup service is that Google "gifts" me with Auto Awesomed shots. Whether it's putting together multiple shots to get a panorama, HDR, or an animated gif, or just applying filters and borders, G+ usually spits out something nice, and admittedly gimmicky, to shoot out to my non-photography friends who won't judge me for using tools like this. As I mentioned yesterday+The Patch - PhotogrAphy Themed CHallenge theme for last week was Water and Landscapes, and I shared some of what I ended up doing in getting some shots for the project. When we first came up with the water and landscape theme I wanted to stay away from my most photographed waterfall in the area unless I felt I could do something different with it. After a river and creek excursion, and with a little daylight left I went to the waterfall to just see what could be seen. A longer post today. Over on +The Patch - PhotogrAphy Themed CHallenge we're doing a month of Landscapes, and this week our sub-theme is Water. Occasionally as a primarily landscape photographer you have to get off the path to get a shot. For this challenge I found myself balanced precariously on a rock in the middle of a stream while my camera, on a tripod, was balanced just as precariously on a fallen tree trunk. As you can see, I need different shoes for this shot. Thankfully no feet were harmed, or soaked, during this shot. — 76 (@76) October 31, 2014 The photo is one I took for my first weekly photo project back in 2012! Thanks 76! This is a favorite spot for both photography and just being alone with my thoughts. On foggy days you can't see the end of this trail. This was taken just after a storm front blew through leaving some great clouds in the sky. Two things drew me to this shot, the contrast between the two fields, and the line between them that nicely lined up with the bottom right corner of my shot, and the farm house, barn, and building at the top of the hill. I actually ignored the clouds and sky, which turned out pretty good too. The Trinidad Memorial lighthouse has been featured often on these pages. Probably one of my favorite photos of the Memorial Lighthouse is this one that was used as a holiday card recently. 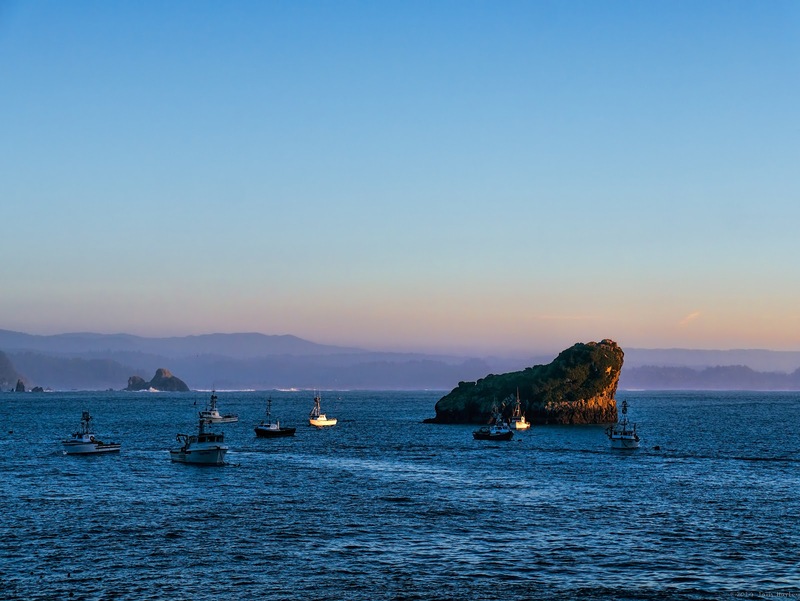 Apparently though there is a functioning lighthouse out on Trinidad Head that the public can only see and access one day a year. Well, this was that day. As you can see the functioning lighthouse is not too far from the memorial lighthouse, and is a nice 20 minute hike from Trinidad Harbor, though the trail to the lighthouse is closed for most of the year. The lighthouse is the same size as the Memorial one, meaning quite small, but is fully automated. Two people on/in the lighthouse proves to be cramped, and the entries are a little tight, but you get an excellent view of water. From the lighthouse, looking inland, you can see a cabin right on the edge of the Head where the fog horn is. I shot fireworks for the first time this past July 4th. My results were pretty hit and miss, with the majority falling in the miss category, though it's not all my fault. I was told my tripod wouldn't be allowed in the viewing area, so I was forced to leave it in the car. I had gotten there early enough to get a good spot right up front and was able to make use of the rail with a 45 degree angle to rest the camera on, but my shots were pretty much click and pray shots. I started off using a small aperture with shutter priority set to about 4 seconds, but found this to be clumsy. Switching to bulb mode, which allows me to open and close the shutter based on how long I hold down the shutter button, worked out slightly better. Again, though, my camera was at my hip pointing up, so it wasn't really ideal. I will say that having a screen that flips and tilts out made this much easier to shoot. Kind of out of the blue today Apple seeming announced that Aperture development is dead and that those resources are being put to the excitingly named Photos app briefly shown at Apple's recent World Wide Developers Conference. On June 2, shortly after the keynote that didn't mention anything about Aperture, I wrote an email to Tim Cook, CEO of Apple, to see what was going on with Aperture. I'd like to think this morning he replied to me. This is a shot I've been working on for awhile. Both behind the camera and in front of the computer. 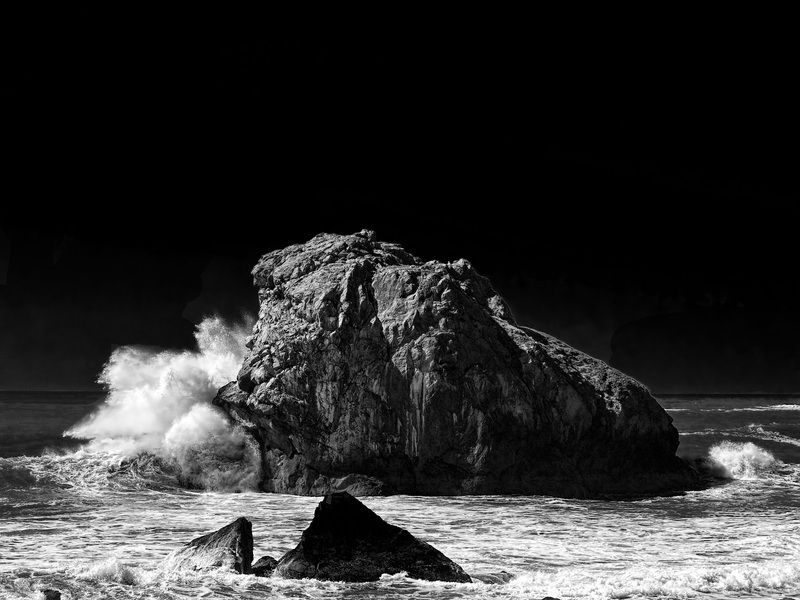 The odd shaped rock has always drawn my eye, and the fishing and crabbing boats behind it make for an interesting scene. Going through my library I found a lot attempts of doing something with, but none that really worked out. This was shot back in January! of this year, and had been forgotten fairly quickly, unfortunately. I'm glad I've been going through the archive to clean things up and found it again. Don't worry, you didn't miss any Aperture news from Monday's World Wide Developer's Conference. Or at least not any direct news. 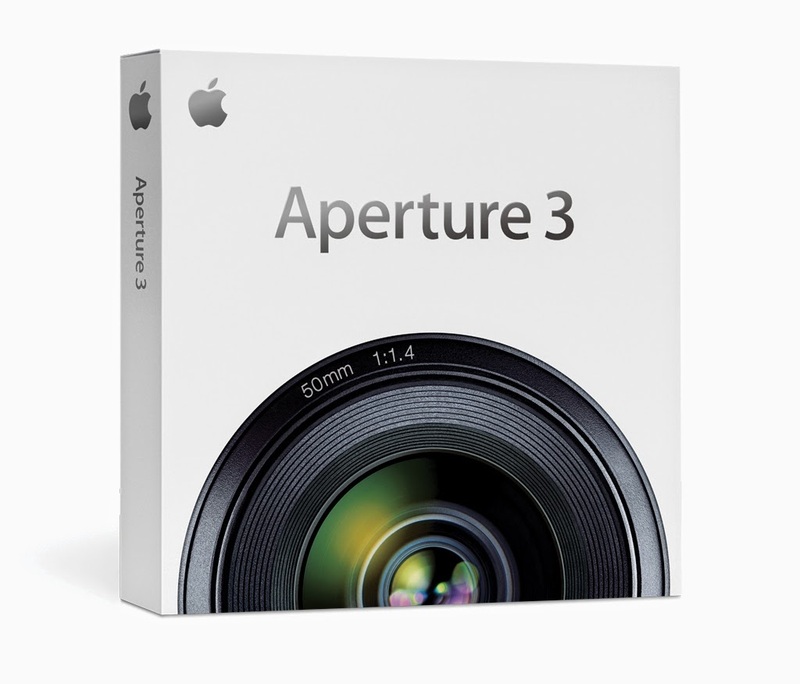 A quick history lesson: Aperture 3 was released in February of, wait for it, 2010. 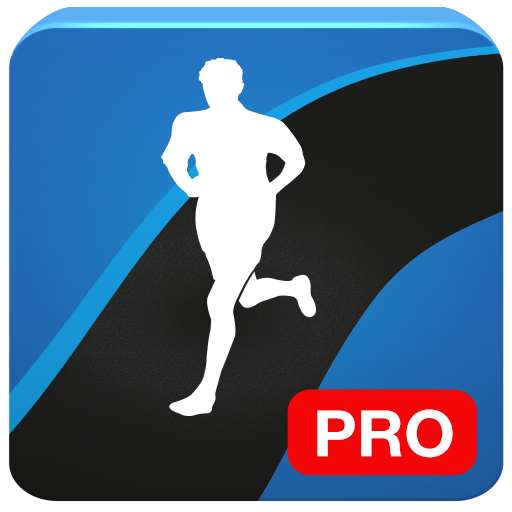 It's current version is 3.5.1, which was released in November of 2013. There's been a steady stream of primarily small updates, mainly to accommodate for new Mac hardware. That's 4+ years of the same basic set of tools, user interface, and backend. I assume the backend part as I don't really get into the code level of Aperture. That's a long time to go without seeing a refresh and when the competition has been elevating it's game. And I catch a lot of grief from photography buddies who have been using Lightroom wondering when (not if) I'm going to switch over. I've been holding on to this shot for a while now. I showed it earlier on Google+ but delayed putting it up here. I felt I could do more, and less, in my post processing. I like the layers in this early morning shot; sun light only hitting parts of the foreground hills, the fog receding, and the curves of the hills. It was a tough scene dynamically to capture. The shot is an HDR to better grab the shadow areas of the photo. Waterfalls. I love finding them and photographing them, so here's a new one, for me; Trillium Falls. Named after a flower that blooms in abundance in the surrounding area. 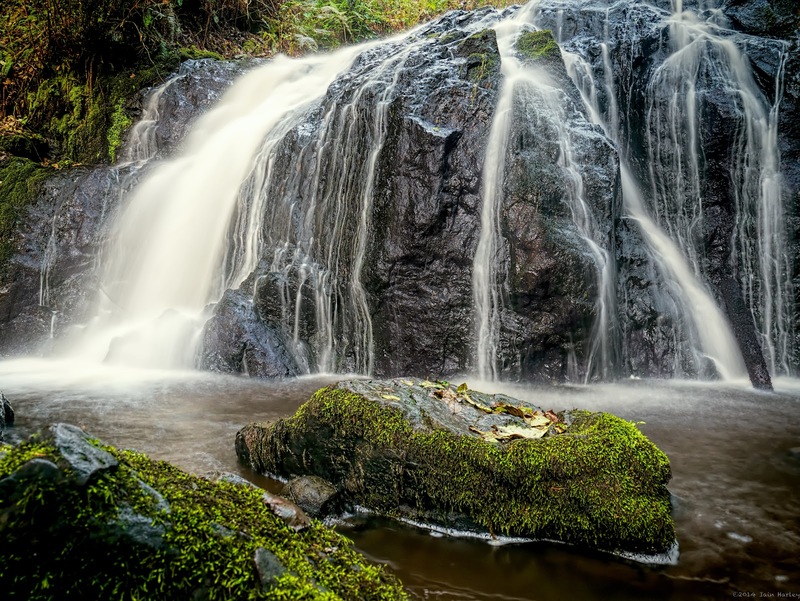 Located in the Redwood National and State Parks, just north of a tiny town called Orick, the falls are easily accessed by a short hike or about a mile or so. If you've never been in a redwood forest it's really a very different kind of place. It's very lush, humid, and green with all kinds of ferns and plants on the ground and towering redwood trees. Sound doesn't escape the forest it echoes inside it. For an outdoor place there's a definite feeling of being indoors. The falls aren't the most exciting waterfalls there are, it's maybe ten feet high, but there are lots of little cascades that make for interesting mini-falls shots. The above shot is taken from a foot bridge and as you can see it's very green. The shot is also an HDR shot. I suppose the subject of this photo is Wizard Island, a volcanic cone on the western side of Crater Lake, but honestly I love the water. Took a quick trip up to Crater Lake National Park in Oregon Saturday. It was as stunning as I remembered it. My first visit here was in the late '90's when helping my friend Cory get back to California for summer break. He was going to school in Washington and he planned a stop here. I'd never heard of it, and this being before the widespread adoption of smart phones and mobile internet, all I could find out about the place was from a AAA map. I had never seen water so blue before, or since. Tahoe is close, but not near as stunning. Interesting note, Crater Lake is not actually formed due to a meteor impacting but from a volcano. Stumbled across an album primarily of sunset shots. I remember at the time not wanting to publish them all for fear I run out of things to post, and I shot them about the same time I shot my zen rock (cairns) focus fun shots. I rediscovered them today and ran across some shots I took for a hopeful panorama. 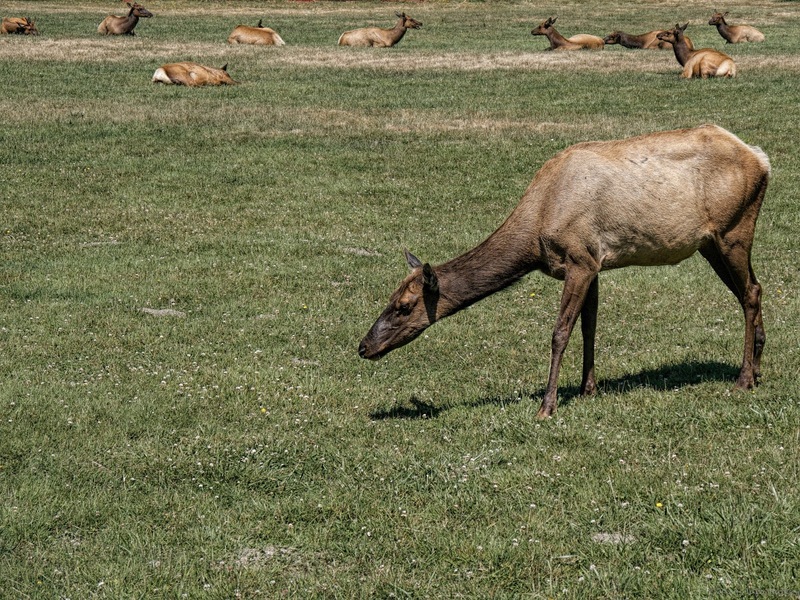 There's one thing I've learned about stitching panoramas with Photoshop Elements 11, if you don't like the outcome the first time around just try it again. I don't think I've ever seen PSE spit out identically stitched panoramas. Now I don't know if that's a quirk in the software or an issue with how I shoot my panorama shots, but it has proven to be very helpful at times. This is a 10 shot panorama with the finished dimensions of 9225x3724 and clocks in at roughly 36 megapixels. And this is not an HDR'd shot. 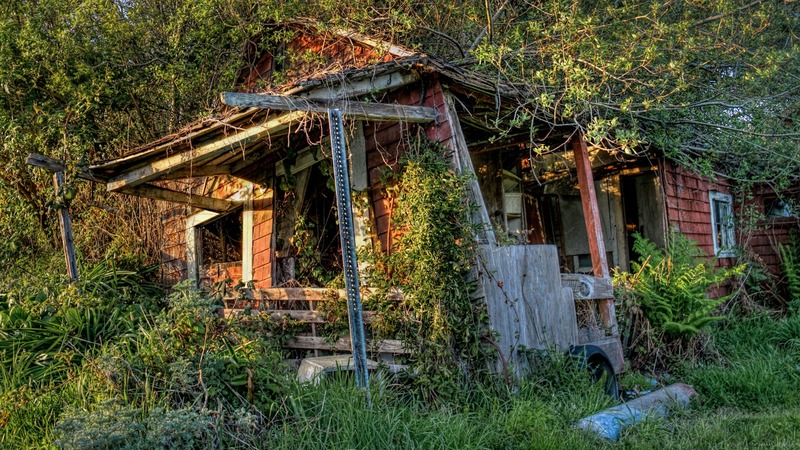 For week 12 at +The Patch - PhotogrAphy Themed CHallenge our theme was Dilapidated structures. While out hunting for some I came across 248 (the address number). I only stopped to shoot this because of the glorious light during golden hour. Though it completely fits the theme. From this angle you can see the brush slowly enveloping it. I wonder if I'd be able to find it again in five years or so. As you can see 248 isn't alone. I took the brackets that made this shot while searching for bridges earlier in the month. I saw this crazy sky and not having much time I just rattled off a couple sets of brackets not quite sure what I was going to do with them. I didn't know if I'd do an HDR or a simple blending of two exposures, but I was hoping I'd get something. I wish I had a wider lens or had taken the time to unpack the tripod. Oh well. Processing wise I immediately went to these brackets as opposed to the bridge shots I had taken for a deadline on +The Patch - PhotogrAphy Themed CHallenge but my mindset wasn't mixing with what I wanted to do with this photo. This photo is a little much. I tried working with a single exposure. Tried playing with a couple exposures, but the ending photo came out looking flat. So I did what I wanted to do from the beginning and just HDR it. Is it realistic? No, not really. Do I like how it turned out? I do. I'm a fan of the +Plus One Collection and their yearly collection that is put together every year with proceeds going towards a charity. This year that charity is the Samburur Project, a charity bringing clean water to areas in Kenya. The Photographers For Good Foundation oversees the project that is primarily spread through the very large photography community on Google Plus. Hundreds if not thousands of photos are submitted every year and the top photos of then put together into a book that is for sale. The other photos not selected for the book are shown on the project's website. You can check out the current submissions here. Of the three months of themes for +The Patch - PhotogrAphy Themed CHallenge it is obvious to me which one has been my favorite so far. The month of March has 5 different architecture categories, and this past week was Churches, and when it came to choosing a photo I found that I had quite a number of shots to choose from with different processing for each. 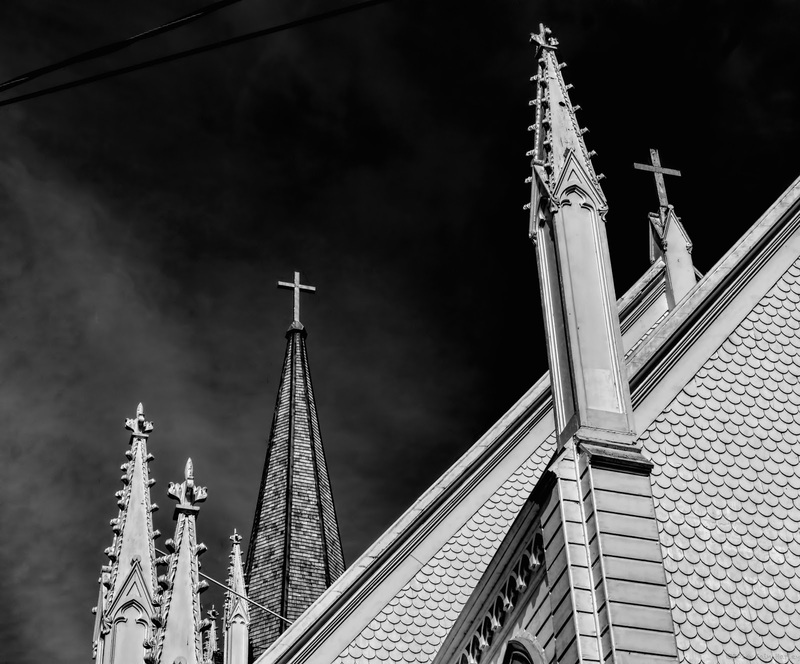 The above shot of Holy Trinity Church, established in 1863 in Trinidad, CA, is the shot I chose to show. This is an infrared shot that gives it, in my eye, a different feel, a subtle glow to it. Our theme for +The Patch - PhotogrAphy Themed CHallenge this week was Bridges. I had a couple in mind at the beginning of the week, but these were bridges I had already shot before and I was struggling with how I'd shoot them in a fresh light. I shot some and thought I was done. When I got them into Aperture and started working on them I wasn't exactly thrilled with them. They met the themes, sure, but they looked like retreads, or worse, exact copies, of shots I had already done. Actually because of the weather recently these shots were worse than the original shots I had done. Basically I would have rather submitted 2 year old photos over these. Over at +The Patch - PhotogrAphy Themed CHallenge we're gearing up for architecture themes for the month of March. If you you're not familiar, I'm helping run a project this year that has both a monthly theme and weekly themes. It's a little more challenging than a typical single theme project and has been forcing participants to think a little bit more about their shots. It's been a lot of fun to see how different people interpret the theme and to get together with my co-moderators to pick winning photos each week, which are then eligible for a monthly prize of a +Topaz Labs plugin. This isn't the shot I'll be using for week one (Building Features & Architecture) but I enjoyed processing this seven shot HDR and thought it'd be a nice prelude to the month. If you're an architecture photographer, or know someone who is, have them check us out. People can join in at anytime. As I've mentioned, I've been struggling with my photography lately, so I've been reading and watching videos on how to improve my skills. As I've also mentioned I'm mostly self-taught, or more accurately, internet taught. I picked and chose what I wanted to learn to get the final image I wanted. I didn't learn the basics until later in my photo taking life. And I sometimes need to brush up on these skills. So on a surprise free day last week I set out with the camera with somethings in mind as to what I wanted to work on. Sadly, the middle of a very bright day out doesn't make for great photography, and what I was thinking to shoot also didn't work out. Then I stumbled across this.